Use the MSA 30X® Sound Amplifier for overall sound amplification to improve your ability to hear sounds around you. Discreet & Comfortable. This small, lightweight earpiece will go virtually unnoticed and is capable of amplifying sound up to 30x. Rechargeable, therefore no batteries need to be changed. Unisex and can be used on right or left ear. 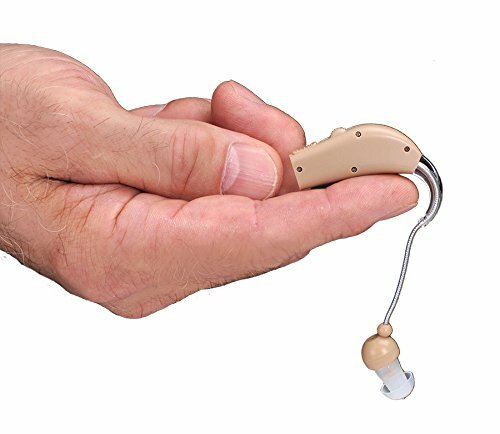 The MSA 30X® is not a substitute for a hearing aid or intended for use by hearing impaired people. Includes 1 MSA 30X®, 6 different sized silicone ear cushions, 1 charging base, 1 adapter and 1 cleaning brush. STOP WASTING MONEY ON EXPENSIVE BATTERIES: MSA 30X is fully RECHARGEABLE: No more replacement batteries that can cost HUNDREDS per year. You get a recharging station, 6 Silicone Tips and 1 Cleaning Brush. No Replacement Batteries Required - Recharges Using An Outlet. SMALL SIZE IS BARELY VISIBLE: Don't be embarrassed by a large unsightly amplifier. MSA 30XTM is a discreet sound amplifier that is ultra-light and comfortable. LIGHTWEIGHT AND COMFORTABLE AND FITS RIGHT OR LEFT EAR: It comes with an assortment of silicone ear tips, so you can easily get a great fit. The 6 silicone ear buds help to make for an almost custom fit while the clear tubing of MSA 30X® fits the contour of the ear making this sound amplifier comfortable and barely visible. ADJUSTABLE VOLUME CONTROL: Up to 30 times sound amplification. Amplifies all sounds, such as the television and distant birds chirping. If you have any questions about this product by MSA 30X, contact us by completing and submitting the form below. If you are looking for a specif part number, please include it with your message.